Decorated with a scene from the Romance of the Western Chamber where Zhang Sheng asks the monk, Hui Ming, to deliver a letter, the other side with figures of an emperor, attendants and musicians. These images would have been taken from popular Chinese woodblock prints that are known to have been imported in Holland but rarely survive. The decoration is very similar to the ‘mixed-technique’ wares produced at the Het Moriaanshooft under the management of Jannetge, the widow of Jacob Wemmersz Hoppesteyn (1627-1671), and her son Rochus Hoppesteyn except that the blue painting is applied with bold black outlines and there is no grand feu green, brown or manganese, just the addition of a strong iron-red and gilding applied in a second or petit feu firing. If the date can be read as 1688 it is possible that this is one of the pieces made by Jeremias Godtling and Willem van der Lith in the Hague. 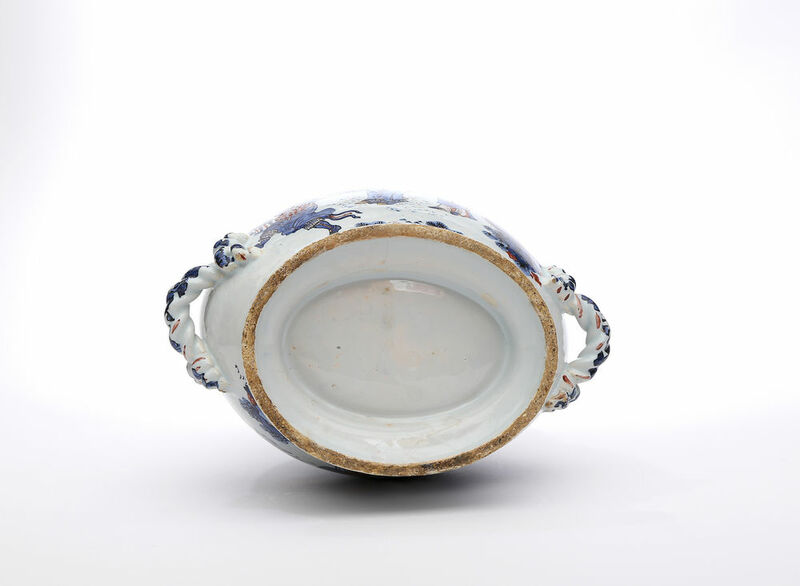 In 1688 at The Hague Record Office an application had been made by Godtling and van der Lith, two potters from Delft, to build a kiln as they had ‘invented the art of making porcelains with gold, red and other colours’. The factory closed at 1701, leaving no trace of production (see Ressing-Wolfert, p.127). Rochus Hoppesteyn is recorded as having placed orders with this short-lived factory, which specialised in red and gold decoration. 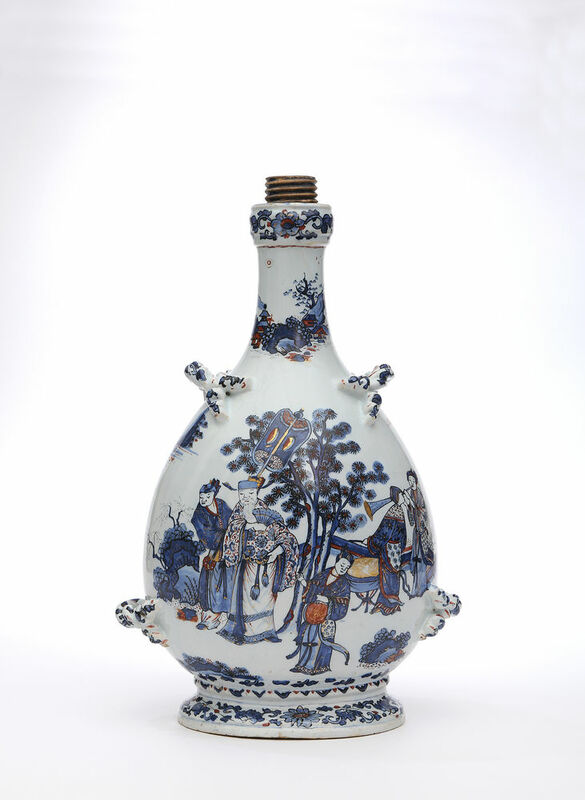 It is unclear if they made the vessels or just decorated pieces from Delft. Actual production is probable since they had been given land from which to take the clay from. 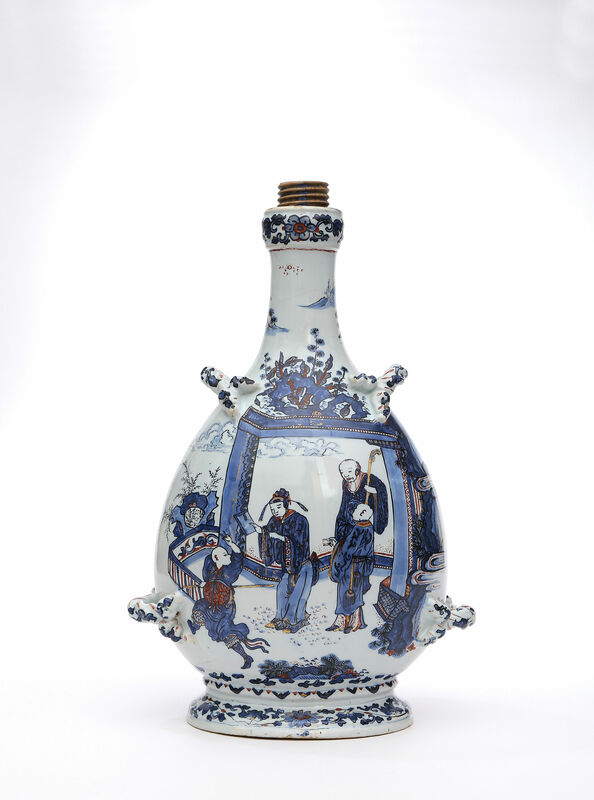 The rich and dense milky white glaze of high quality is comparable to the best products of Delft such as those of the Het Moriaanshooft factory. No other pieces in this style with just the addition of petit feu red and gold appear to be recorded. Professor Jean Justice, in his Dictionary of Marks and Monograms on Delft Pottery, records that Johannes Mesch deposed a similar MES monogram in 1680. Condition – Extensively damaged and restuck. In spite of the extensive damage there are few losses, 99% of the surface is original. H.E. van Gelder, ‘Een Haagse Fabriek van Delftsch Aardewerk”’, in: Feestbundel Dr. Abraham Bredius aangeboden den achtienden April 1915, 2 parts, Amsterdam 1915, part 1, pp. 37-52. Professor Jean Justice, Dictionary of Marks and Monograms on Delft Pottery, London, 1930.